Mixing and storing the dough: Squeeze the cooked spinach through a strainer (or put in a clean tea towel and twist the towel) to get rid of excess liquid. 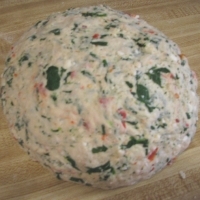 Mix the yeast, salt, spinach, cheese, sugar, black pepper, red pepper flakes and smoked sun-dried tomatoes with the water in a 5-quart bowl, or a lidded (not airtight) food container. Mix in the flour with little kneading, using a spoon, into a 14-cup capacity food processor (with dough attachment), or a heavy-duty mixer (with dough hook). If you’re not using a machine, you may need to use wet hands to incorporate the last bit of flour. Cover (not airtight), and allow to rest at room temperature until the dough rises and collapses (or flattens on top), approximately 2-2.5 hours. On baking day and if dough is refrigerated: Quickly shape it into a ball by stretching the surface of the dough around to the bottom on all four sides, rotating the ball a quarter-turn as you go. Allow to rest and rise on a cornmeal-covered pizza peel (or a good, thick baking sheet) for 1 hour (or just 40 minutes if you’re using fresh, unrefrigerated dough). Twenty minutes before baking time, preheat the oven to 450 degrees F, with a baking stone placed on the middle rack. Place an empty boiler tray on any other shelf that won’t interfere with the rising bread. Sprinkle the loaf liberally with flour. (BIG NOTE: I do NOT do this as I think the flour takes on a weird burnt taste in the high-heat oven. Do what you will – but I skip this flour sprinkle) and slash a cross or tic-tac-toe pattern into the top, using a serrated bread knife. Leave the flour in place for baking; tap some of it off before eating. 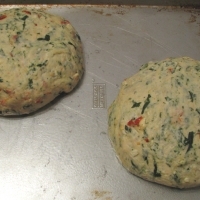 Slide the loaf directly onto the hot stone – or place baking sheet with risen loaves in oven. *Important* Pour 1 cup of hot tap water into the broiler tray or small baking pan, and quickly close the oven door. Bake for 30 to 35 minutes, or until deeply browned and firm. Smaller or larger loaves will require adjustments in baking time. Plus 10 othersFrom around the world! This looks fantastic, very mediterranean, especially if you throw in some kalamata olives too. Hi Vickie! I wrote a big long comment here and somehow lost it! Trigger's picture and yours look so enticing! I love to bake breads, though I haven't done so in at least a year! Nancy Silverton of the La Brea Bakery in Los Angeles was my "go to" bread authority. Your addition of sun-dried tomatoes and red pepper flakes sounds perfect! Thanks for putting so much effort into your instructions! This sounds fabulous! And I enjoyed reading your story. Great post, thanks for sharing. 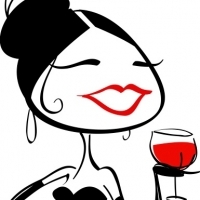 It looks fabulous, Vickie! From the ingredient list, I can tell it is bursting with robust flavors! I love the sound of feta in a bread. Thank you for the recipe, as well as your detailed instructions. Bookmarked + ^5 + flagged for beauty! Hi Vickie! This recipe is wonderful! It looks delicious and I love the flavor combinations. Your instructions are so clear, it makes it seem possible - even for a beginning baker like me. That you for posting...sadly I am only allowed to give you a high-five..you deserve so much more for this recipe! I am a bread baker and I am in love with this recipe. Now I know my weekend bread project. Oh the ingredient combination is A1 supreme I love the instructions and added this to my group "Shortcuts and Cooking Tips" for it's well written content. Ten forks and a flag for beauty and unique. Oh, I bet this will taste amazing! Looks and sounds so delicious! 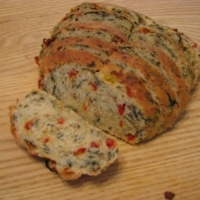 I love spinach here and your additions of smoked sun-dried tomatoes and red pepper flakes sound great! I love this! Since living in China it is extremely difficult to get artisan bread or any real bread for that matter, so this recipe is like a god's miracle to us, ha! I will sooo try this recipe this weekend and it looks very easy plus I love that it only requires all purpose flour. Thanks again and I can't wait to see your other bread recipes soon. What a beautiful loaf of bread! 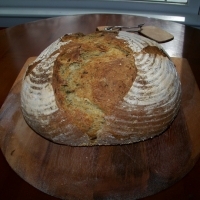 Thank you so much for the details, as I am new at this, but want very much to learn to make good bread at home. I can't wait to try this delight - what wonderful flavors! Thank you, Vicki, and I'll look forward to more of your "creations" as you perfect them!! Like lunasea's recipes? Never miss an upload!